I am not that good with words when it comes to books that I totally adore, so I drew a picture:Source: http://gerynh.tumblr.com/post/1070469...This book might be for you if you:- enjoy mystery, horror and fantasy perfectly blended together!- don't get spooked easily ;) some scenes are pretty intense... - don't mind unpredictable story and characters that will keep you guessing what their true motives are until the very end.- love reading about unusual creatures, the dark and light fae and an interesting mix between Christianity and the Faerie lore.- like books about Medieval England - prefer three-dimensional characters, except for the the evilest villain you can get!5 stars! There are tales of creatures who pass freely amongst the stars, who were ancient when the world was new. They have the dust of creation on their feet. They have many names. Angel is but one.Well this book sure did take me by surprise. I did not have big expectation when I started this novel. Even though the cover is absolutely beautiful, but the Goodreads rating was pretty low, so I expected to read a simple, short novel to kill time. However, when I started reading it, I got sucked into the story, and when I looked at the page number, I was at page 170. Not in a long time did a book surprise me this much.The Crowfield Curse is set in 1347, and we follow our main character Will, who lives with monks, on his adventures that are filled with creatures such as hobs, fairies and angels. What surprised me the most was the world Pat Walsh created. At the same time, she was historically correct with the way monks lived, but she also blended that world so beautifully with the fantasy world. Also, not in a long time did I read a book that follows such likable main characters. I loved their chemistry, and I loved how the dialogue felt real, even though it was set in a fantastic world quite different than our own.To conclude, this novel surprised the heck out of me and I would definitely recommend it to anyone who loves a good story. Humor, horror and adventure aspect of it were perfectly blended, and the book easily entered my 'all time favorite stories' list. I just hope that I'll get my hands on the sequel as quickly as possible. A medieval mystery of sorts for kids (with a bit of magic thrown in), The Crowfield Curse is a wonderful adventure.Set in 1347, the story follows monks' apprentice, William, as he finds himself caught up in a battle between light and dark forces that seem to surround the abbey where he lives. After finding a hobgoblin caught in a trap, Will's eyes are opened to the magical creatures around him. There are several "fay" creatures, old pagan gods, witches and healers, and a secret buried deep in the woods.Will is a great character. He is kind, fair, and tender-hearted, able to move past conventional beliefs in order to see the bigger picture. Although frightened a great deal of the time, he continually strives to do what he believes is best for others -- all adding up to a strong hero.The mystery that Will is drawn into is genuinely intriguing -- I didn't know how everything was going to turn out, and even after I thought the story was pretty much finished the author threw in another new development.The hobgoblin, Brother Walter (he refuses to tell William his real name because he doesn't want William to have power over him), is adorable -- I would love to see this made into a film, just so I could see this character brought to life.The author doesn't skimp on historical detail, even if it is a book meant for children -- this is a very detailed look at medieval life (monastic life, in particular), and it really shows how difficult life was then. I was also interested to see how matter-of-fact the hardships were -- it's hard to imagine anyone today being so philosophical about hard work, hunger, or cold!I think this would be an interesting choice for older kids, especially those interested in that time period or in magical creatures. This does not have the charm of the Harry Potter series, but it's a wonderful book nonetheless. My copy includes a preview of the sequel, The Crowfield Demon, which looks to be quite good as well.I would also note that the cover of this book is very pretty, reminiscent of those old paintings that feature black silhouette characters on top of a painted background. If you look closely, you can see a few of the featured characters represented. Some very good things here. The setting, for one. Solidly medieval fantasy is unusual in books aimed at middle grade and young adult audiences. And Walsh has obviously done a lot of research into life in a medieval monastery. Better yet, she doesn't let her enthusiasm for the period get away from her. I've read too many books by authors who get so enthused with what their research has uncovered that they forget they're writing a novel. The mythology she builds has enough elements to make seasoned fantasy readers feel familiar with her world, while still adding individual touches to make it her own. For example, both the Seelie and Unseelie courts come into play, if not exactly featured, but so do angels. Fairies and angels, not exactly a usual combination. Walsh has a gift for setting. Her descriptions of the cold, bleak Crowfield Abbey and the woods around it were vivid enough to leave me shivering. I could picture everything that she described, and she didn't spare the description. I liked how she didn't reserve the full descriptions for what would eventually become important to the plot. It made Crowfield feel that much more real.I also appreciate how the story wrapped up. The Crowfield Curse is definitely a single story, with a beginning, middle, and end. And yet there are plenty of loose ends, enough to avoid a sense of finality without leaving the reader frustrated with a cliffhanger ending. Which is exactly how I prefer a book that's part of an ongoing series to end, especially when I'm unlikely to finish.So why's that? Simply put, I couldn't get attached to Will. I don't have an issue with the way he's written. His voice rings true, in his time and in his circumstances. But I still couldn't bring myself to like him much, to root for him, want him to do well, and be interested in how his story turns out. I have no doubt that other readers will love him, but it was just a misfire for me. And I was a little disappointed in how she handled the local village's wise woman, Alys. (view spoiler)[Who, it turns out, can objectively be described as a demon-worshiping witch with the goal of corrupting the extraordinarily pure Will. It feels awfully cliche, and seems to throw a book's worth of more balanced development of her character right out the window. (hide spoiler)]I can see where this would be a hard sell. What would be the audience for a middle grade or young adult book set in an authentically written medieval monastery? But those readers have to be somewhere, and this would be quite a treat for the right person. This book caught my eye at the library with its GORGEOUS cover: the silhouettes stand out starkly against the fairy-tale-ish castle in the background, the 'splashes' of snow and the character's posture and the flow of the clothes do a great job of creating the illusion of movement, and the red foil is a wonderful touch that could easily have been overused, but wasn't.And... I loved it! What a wonderful surprise.I think what I liked best about it was that you had a 'chosen one' story without a Marty Stu. With the first half of the final Harry Potter movie just out in theaters, that was something that really resonated with me. Will is a wonderful young man, but despite his gift, he's fairly ordinary, and that was refreshing.Also - the other characters were well-developed. And the main storyline went about as I thought it would, but the subplots had some interesting twists and turns. I gave this book five stars based on the originality of the concept within it's pages. I have read stories I enjoy more, but the overall idea of this book won me over. Set in 1347, the author's detailed descriptions transport you to a monastery in England. You see the dark light of winter in the cold stone abbey, feel Will's and the monk's frost-cold fingers, hear the bells calling the monks to prayer, even taste the horrid pottage made by the irrascible cook and smell the privy. It is a hard life, especially in winter, but there is also beauty in Brother Snail's herb garden, in the wood's flora and fauna, in the warm friendship betwen the hunchbacked infirmarer (Brother Snail) and the orphan servant boy (14-year-old Will, who lost his family to a fire). Bauer's world is well-realized.The tone is spooky with the Dark Fey King who is cruel to the Seelie (Light Fey), humans and animals. The plot is mysterious: one never quite knows who Will can trust (except for Brother Snail). Then there is the hob, or hobgoblin, that Will rescues from a trap and brings to Brother Snail for healing. He is a cat-sized creature with brown fur and a long (prized) tail, intelligent in the ways of the wild and inherbs. He makes Will think about other creatures besides humans, that he share the world with animals and trees. Since he won't give them his name, they call him Brother Walter.Will learns he has the Sight and is able to see the Fey as few others can. His honesty and purity also make him a target for strangers who come to the abbey on a mysterious errand. Will is thrust into a miasma of hate, long-guarded secrets, evil and curses. Master Bone and Shadlock (who is a Seelie Fey) use Will to obtain a secret, but it is Will's goodness that allows them to gain their deepest desires. I was drawn deeply into this story, so that I wanted to explore the author's website at www.pat-walsh.com. She is an archaeologist and amateur historian living in Bedfordshire, England. Her blogspot in journal form by Brother Snail contains photos of the English countryside, and information on the beliefs and seasonal celebrations of the times. A sequel, The Crowfield Demon, is due out in Spring. I look forward to seeing and hearing Will's learning of the flute, Brother Walter's new life with Brother Snail and the continued magic of the Fey.As The Times of London said: captivating, evocative, charming and exciting. The Crowfield Curse is a magical and wonderfully lyrical story, with a truly rich and believable historical setting. The story has just the right blend of everything - old world magic, horror, suspense, thrills, fairies, monks and a boy with tremendous courage and compassion - and the Sight!Pat seamlessly blends the reality of Middle Ages Christianity with the old belief systems that tie into nature worship and in the middle of it all, she places Will, an orphaned boy, pretty much alone in the world and very much a servant to the monks of Crowfield Abbey - until he encounters the hob. The hob, whom Will names Brother Walter, for the creature will not reveal his true name, is a wonderful character. In fact, all Pat's characters are rich, well-rounded and carefully presented. This strength of characterisation, together with her evocative descriptive ability, makes The Crowfield Curse an exciting, gripping and brilliant read.The Crowfield Curse will appeal to boys and girls of 10+ alike and would particularly appeal to fans of Catherine Fisher, Dianna Wynne Jones and J K Rowling.I can't wait for the next installment of Crowfield and Will's further adventures! A lovely fantasy tale of an orphan raised in a 14th century abbey. I loved how the author accurately described the winter atmosphere of the forest and the life of the monks living in the abbey (there are a useful timetable of daily worship and a glossary at the end). The middle ages setting reminded me a lot of the delightful and underrated 2009 animated movie “The Secret of Kells”. If you liked that movie, this book is for you. So far, so good. I bought this book for my niece for Christmas after seeing someone book-talk it at a librarian training this fall, so I decided to read it for myself. I like the mix of history and the supernatural, this would appeal to boys for sure!Finished this over the weekend . . .LOVED IT! I hope the author writes more, I really liked the historical aspect of it, including life in a 14th Century Abbey, and the character of Will was very appealing. Good read! We are introduced to a fourteen year old William who is living in an abbey among christian monks after the death of his family. The story quickly introduce another character primarily known as the hob, later known as Brother Walter, whom William saved from an animal trap. The hob gives us the idea of magical creatures running around in this book, and it is very intriguing seeing how these magical creatures are written together alongside of christian monks and what-nots. Soon afterwards readers are introduced to other characters such as the monks and the villagers, a plot unravels at the arrival of a leper and his mysterious manservant and soon afterwards, William learnt of the Crowfield Curse.I find the story behind the curse is interesting and beautiful. And I love how Pat Walsh describe the quiet setting of the abbey, of its monks and their prayers as well as their duty-filled days in contrast to the quiet terror lurking in the wood and the mysteries that cling around the plot. Instead of the usual acceptance of other living creatures other than human in most fantasy book, this one makes even the knowledge of knowing such creature is fearful and almost fascinating. Fearful in a sense of what these creatures could do to the short-lived and unknowing human, fascinating in a way that these creatures also were created and live under the same Creator of the human. In fact, this book might as well gives out the idea that not all in the world is black and white. Also, the question of human's superiority towards other creatures came alight into this book and I found it quite refreshing. Just as much as human thought they hold power over other creatures, the creatures clearly hold the same idea towards human.I think what really draw me to this book is the humble spirit it presents throughout its characters, and that the idea that hatred can sometimes be born out of fear. And also the profound joy when one finds out about the existence of an entirely powerful being who, instead of acting out all mighty in front of the lesser beings, is compassionate and benevolent. Furthermore, I love that instead of writing off the monks as stereotypical christian bastards or highly divine men of God, Pat Walsh presented them in their imperfection as human, which is very realistic. If there is going to be the next book, which the ending clearly hints, I'll be waiting faithfully for it. Pat Walsh's atmospheric debut offering is a historical fantasy with a magical twist. Gone are the expected swords and battles, and in their place are mysterious angels and loveable hobs.A hob is a fay creature, with similar physical attributes to that of a fox. They can hold conversations as well as the next human, and prove quite useful when unravelling age-old mysteries of angels buried in nearby forests. Brother Walter is a lovely little guy, and due to my enthusiasm for tiny creatures, I fell in love with him straight away. He was by far my favourite character, though Brother Snail came a close second. I had a bit of trouble connecting with William, just because he didn't present himself as a particularly endearing character. I liked him more as I got to know him, but he didn't leave a strong impression on me.The setting of The Crowfield Curse is fairly unusual for a YA book, and isn't something I remember coming across before. An isolated abbey makes for an intriguing place of residence for the monks, and provides a sense of isolation that makes the story seem that much more ominous.The arrival of two strangers sees life at Crowfield Abbey take a turn for the creepy, and William uncovers a local legend of sorts. With the help of Brother Walter and Brother Snail, a fascinating history unfolds, and that's when the story really finds its feet. Up until that point, things move along at a fairly slow pace, while Walsh sets everything up with the utmost attention to detail.1347 is an interesting time period to explore, and this is one of The Crowfield Curse's most appealing elements. Walsh took a chance on an almost forgotten time, and I think it more than paid off. I can't wait for the sequel and the return of the fay creatures, and I just hope Brother Walter keeps himself out of trouble! I liked this book, and would give it 4.5 stars if that was possible. It has an intriguing story line, a unique setting, and a very likable protagonist name William. I've read some reviews of the book, and those who don't seem to enjoy it much complain that the story unfolds too slowly. There's not enough action or character development. I disagree with this assessment and would argue that the narrative unfolds in accordance with William's personality. He's not a thrill-seeker. Like many a good fantasy character before him -- I'm thinking of Bilbo or Frodo here -- he's thrown into/made aware of a world he never sought to enter. Having said that, though, once William's cognizant of this other world of hobs and fays, he does his best to make the right choices. In this respect, this book is an excellent choice for young readers. It subtly illustrates and rewards William's open-mindedness and teaches respect for all spirits in creation. I was also interested in the way that the book aligns a more traditional christian belief system with what might be considered paganism. Again, I thought that this was done with a light, but nonetheless pedantic in the best sense, touch. All in all, this is a book well worth reading for YAs and fantasy lovers of all ages. It's fine.Orphan, adventure, fairy creatures, monks, dead angel, a witch, curses. Nothing new or surprising.I liked that Will's not frustratingly slow to pick up on what's going on. That's good. But I figured the whole story out really early on so reading it to the end was just killing time.However, I'm not a 12-year-old boy or girl and because I've read this type of story before, I could suss out the plot. It might be more surprising and engaging to someone who did not know what was coming.I think the use of old English church terms could be a potential stumbling block, especially since they're not all listed in the glossary. The author is obviously passionate about her work but that may not make much difference to a young reader who may wonder why the term "couvre feu" has to be used so very often.The writing was just good enough to keep my attention and the story just good enough to keep me entertained, but I doubt I'll recommend this to anyone over the age of 13. I wish they had half-star ratings for this. Two seems a bit little, yet three a bit much. The Crowfield Curse is an easy and somewhat captivating read, though its one of those books I can imagine myself forgetting the plot of one year down the road. It's not very memorable, the story wasn't impressive enough to stick, especially once you got over the captivating part. Then again, I haven't read many books about fairy folk, so I know very little about the kind of stories you can tell with them as characters. Walsh laid too many clues out for three-quarters of the story, so the climax to clues ratio was unsatisfying (read: anti-climax). The ending also sounds like a lead in to the next book, though I'm not sure if there IS a next book. A brilliant book I loved it and can't wait to read the next book in the series! I was excited to read this book, it looked like an excellent middle grade historical fantasy with some creepiness added. It ended up being okay, but I had some trouble engaging with both the story and the characters. There is a second book in the series called The Crowfield Demon.Will is sent to live at Crowfield Abbey after his parents die. There he works in the kitchen for the monks. While in the forest one day he hears a cry for help and discovers a hobgoblin, apparently Will has the Sight and can see the Fey. When some strange visitors show up at the Abbey, Will is drawn into a mystery involving a buried angel and some evil Fey.I had a lot of trouble reading this book, but I also had a lot of trouble figuring out exactly why. The book is a quick read and the storyline is interesting. The book is kind of creepy and very much a historical fantasy mystery of sorts.I found Will to be a very uninspiring character. He just came across as very dull to me, the only thing that made him really stand out from anyone else was the fact that he had the Sight. I just had a lot of trouble engaging with him as a character.The story also lacked description, so the scenes never really came alive. I had trouble picturing the settings and again trouble engaging with the story. The whole thing was just told in a very dry way.I did find the story intriguing. It was interesting how the monks put religious beliefs toward explanations of their fey neighbors. The story wasn’t completely predictable and there is some interesting world building going on. Overall this was an okay read. The story is interesting enough, but it is told in a very dry way and the characters were hard to engage with. By the time I finished reading the story I forgot it, it was just that kind of book...a very forgettable read. I will not be reading the sequel to this series. I was kind of hoping that this would be a book similar in tone to The Last Apprentice series by Joseph Delaney, but that series is much better than this one. This was a younger YA that’s been popping up in my book list (age group ala Percy Jackson). It’s set in a medieval monastery which should tell you right off there isn’t much in the way of women in this and they would be inappropriate given the setting. The story revolves around young William, an orphan now being raised as a monastery servant. He was the only survivor of a mill fire that took his family and he has the Sight, i.e. can see the fae folk. About his only friends in Crowfield is Brother Snail, a monk with a bone disease where he’s curling in on himself and stiffing up and Peter, the mildly retarded lay brother.It opens with Will finding a Hob with his foot stuck in a metal trap. Freeing the hob, Will rescues him, taking him to Brother Snail, the healer. Snail and he nurses the hob back to health forging a bond. The monastery, a very poor one, has just been paid a large sum of money to house Master Bone and his servant Shadlock but when he gets there they learn he is a leper.Also he and Shadlock, along with Will for other reasons, are trying to work out the ‘curse.’ It turns out a century before an Angel was killed in the woods. The monks took a feather and buried it. Shadlock and Bone are both cursed by the Unseelie king. Bone was a human musician who had the favor of the Seelie queen and Shadlock was her warrior. Will doesn’t really want to help the cold Shadlock but he has little choice. He is swept up in the search to find the angel but the Unseelie king kills them all.I enjoyed this far more than I thought I would. Will is engaging and the storytelling is well paced and exciting. It’s the first in a series (goodreads says it’s only a two part series but I could see the potential for more.) I will definitely be looking for the sequel. Zažili ste v detstve čítanie rozprávky od mamy, vy schúlení pod paplónom a za oknom padal sneh? Pretože presne taký pocit som z knihy Crowfieldska kliatba mala ja. Pre tejto knihe som mala pocit, že si jednoducho musím navodiť tú správnu atmosféru, aby som ju mohla pokojne otvoriť a začať čítať. Z Crowfiledskej kliatby totiž čaro akýmsi spôsobom sála a ja som si to užívala.Celý príbeh sa nesie v duchu tajomna, mágie a čarov. Sprevádza nás plynule Crowfieldskym opátstvom a skromným Willom, ktorého mnísi prichílili pod svoje " ochranné krídla ", pretože celá jeho rodina zahynula v strašnom požiari. Onedlho sa začínujú diať čudné veci. Najprv narazí Will na zvláštne stvorenie ( Hob ), ktoré zachráni a to ešte nevie, že o niekoľko dní bude mať opátstvo čudnú tajomnú návštevu. Jacobus Bone a Schadlok...prišli hľadať hrob a nie hocijaký. V každej správnej rozprávke je samozrejme aj obraz dobra bojujúceho proti zlu a autorka ho cielene ťahala dejom tak, aby čitateľ chcel vedieť NAOZAJ CHCEL VEDIEŤ čo zvíťazí.Autorkine opisy boli také uveriteľné. Tie opisy chladu, zimy a lesa prikrytého snehom, som si užívala a ešte viac som sa zakutrala do deky, lebo mi prišlo že tú zimu mám hádam aj za nechtami. Tak isto boli opísané aj postavy v príbehu. Jednoduché opisy nič zložitého, ale za to veľmi predstaviteľného. Postáv v príbehu síce nebolo veľa ale ich prepracovanosť a jedinečnosť každej jednej dodali tomuto príbehu šmrnc. A kto by to bol povedal, že taký hob, či prasnica Mária Magdaléna mi prirastú k srdcu ? :DPovedala by som, že kniha Crowfieldska kliatba nie je len pre deti, pretože sa nájde aj nejeden dospelák, ktorý sa nechá strhnúť čarovnou atmosférou tejto knihy. Ak máte radi čary, škriatkov a takú tú rozprávku, ktorú máte vyhradenú na zimné večery, toto je tá pravá kniha pre Vás. What a wonderfully atmospheric book this is! I know it seems like a strange point to latch onto first, but the weather in The Crowfield Curse is almost a character in itself - the constant cold that seeps through everything is the perfect recurring theme for this chilling and at times slightly claustrophobic book. The pace is slow and contemplative, which fits the narrative perfectly: the journey does not begin with explosions and a hurried race away from the forces of darkness, but instead starts with the discovery of an otherworldly creature who has little to do with the main conflict other than to provide his charming companionship. I really loved the organic way the plot unfolded which felt perfectly in tune with the life of a boy growing up in an abbey in the middle of nowhere, and I particularly enjoyed the little flourishes of Will's life in the abbey - the less than appetising pottages prepared by the cook, his trips into the forest to feed the pigs, the respite from the cold in the warming room.That's not to say this book is without some hair-raising scenes, and indeed, I feel like the horror elements in it are heightened by the quieter scenes, because this has some of the most genuinely creepy concepts I've ever encountered. Without giving too much away, I really enjoyed the distinctive take on a very familiar mythical creature. It reminded me a lot of the beautifully grotesque spirits in the Miyazaki film Princess Mononoke. The menacing fae creatures were wonderfully threatening without ever being overtly so. All in all, The Crowfield Curse is one of the best examples of quiet horror I've ever seen of where less is definitely more. I really love this book - lucid writing, fantastic (in all senses of the word) characters, scary suspense, unusual magic and danger. The story unfolds through the eyes of Will, an orphaned abbey servant, who finds unexpected friends through his own good actions, but those actions also cause him to become embroiled in ancient, magical, dark mysteries. I love that some characters are neither good nor evil, just mysterious and dangerous and run with Will through the story; that characters who should perhaps be looking out for Will are instead focused on other worldly things; that Will (and the reader) can not quite understand what exactly is happening or who to trust and must try to work things out for himself - these reflect many children's own experience.The crisp, snowy winter landscape generates its own magic through vivid brief descriptions. Abbey life, hardships and questionable characters are painted deftly, and magic peeking through the cracks in daily life is beautifully done. The childhood experience of a spooky place to be avoided at all cost is a central theme.The magic and magical characters provide the greatest appeal for me - unusual, refreshing, and though startling to Will, woven into the fabric of daily life with the sense of a generally invisible world parallel to this one. The magical characters have their own stories and motivations, and brush up against Will as his story crosses theirs.Fabulous writing, wonderful plot, terrific sense of wellbeing engendered at the end of the story.Highly recommend this beautiful book. Will is fifteen; an orphan in the Crowfield Abbey who works hard for his keep. When he discovers an injured hob in the woods and brings him home, everything begins to change rather rapidly. The Crowfield Curse is a well-written, faced paced story for young adults which very much resembles the front cover in mood. I found myself almost shivering with the cold, colourless imagery of the Abbey and surrounding woods. This book is a very well-executed blend of realistic 'middle ages' environment and traditional 'otherworld' characters. I am very much looking forward to reading the second installment and seeing Will finally leave the Abbey and pursue a less frigid path.I would recommend this story for older children, perhaps 12 - 15 because it is quite a dark story with some gore and animal death (fairly graphic). 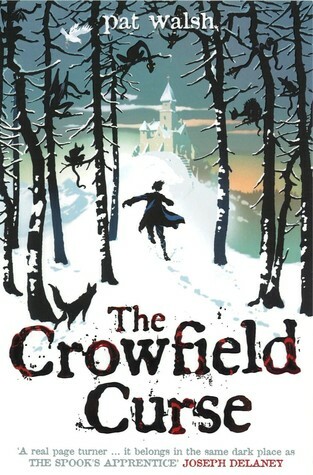 Definitely worthy of its shortlist in the Times Children's Fiction Competition, The Crowfield Curse was an interesting and memorable story which left me wanting more. What I liked: the medieval setting, the hob called Brother Walter, Brother Snail, the abbey's hardships, the accurate history, the faerie folklore.What I didn't like: the near complete absence of females (including the fay), the muddled all-mythologies are true but there's still only one Creator theology.I'd certainly be willing to try another book (this is pretty obviously the first in a planned series). When I picked it up I had no idea the whole Seelie/Unseelie court issue was going to come up just as in 13 Treasures. If I had to choose between the two, I'd pick the other for the more interesting cast, but I really liked the historical aspect of this one. Will, a boy who was mysteriously saved in a fire that killed his family, knows a deep and horrid secret. Something is buried in a grave outside the Abbey where he lives, something everyone thought couldn't die. As foes find out he knows the secret they are planning something deadly. As secrets lurk around the Abby other creatures do, some evil other friendly. Will Will know what creature to trust or will the secret fall into the wrong hands. I would recommend this book to anyone in grade 6 to young adults. As the spooky mystery unfolds tension rises. This was a spooky, mystery, and action filled book. Make sure to read its sequel. Im Winter 1347 gerät der Junge Will in Gefahr. Sein hartes Leben im Kloster wird durch den Fund eines Kobolds und der Ankunft von zwei unheimlichen Fremden in den Grundfesten erschüttert. Es gilt ein Rätsel zu lösen um ein mysteriöses Grab im Wald zu finden. Das Jugendbuch hat einen sehr schönen Schreibstil und ist schon ein wenig gruselig. Damit mir der Lesestoff nicht ausgeht und ich das Schicksal von Will weiterverfolgen kann, liegt hier auch schon der zweite Teil.